I use this product on my mountain bike when I have to put on road tires. Road tires on a mountain bike you ask? This is for New York City's Five Boro Bike Tour. Where you travel with 32,000 fellow bicyclists and visit all 5 boros in 40-44 miles. Some of these cyclists even know how to ride in a straight line. One time I took the tour with my road bike and someone rode into my derailleur. (Er. Sorry he said..), so for this ride I leave my road bike at home. It is sufficiently long and early enough in the season that I didn't want to use my Mountain Bike tires. This application is uncommon enough that it is hard to get tubes in the correct size. Bike Tires direct had the correct tubes in stock. And Michelin is my favorite brand of bike tubes. I was glad that I bought them and kept a spare in my saddlebag. I got a failure in my on-bike tube whilst on a training ride. This was NOT a Michelin tube and I had a handy replacement. It failed around the valve and would have been a show stopper if I didn't have a replacement tube. The Michelin tube worked great. I finished the training ride and rode the five boro bike tour with no problem. I would certainly recommend these tubes. Needed new tubes when converting my MTB to a roadie. 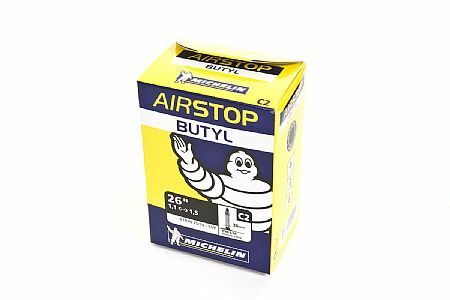 The C2 Airstop is perfectly compatible with the Michelin Protek tires sold through BTD. Have limited mileage on the tubes so far, but the construction and good support of the tire indicates what appears will be a longer term value. I ride road mostly and see A LOT of tube destroying debris. Tubes is tubes to me, the Airstop is a little lighter than Kenda's standard, both are butyl, Kenda seems more substantial. But I also want to take a moment to talk about the GREAT SERVICE I have received from BIKE TIRES DIRECT. Local shops have disappeared where I live, used to be 3-4 now there is one and they struggle. I've used other online bike shops and they are OK but after a few orders and one product issue I can say BTD is the best. Great products, more choices and a staff that treat you good when there is a problem. Accurate and quick delivery and super customer service ... SUPER!